SJ Inno Tech is an innovative and leading supplier of SMT printers and products for the solar energy industry. The SMT screen printer range includes closed loop SPI (520 SPI), board length up 1400 mm (1300 S), dual rail (350MD) as well as printers for high mix - low volume. 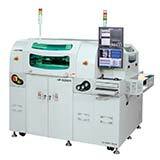 SJ Inno Tech SMT stencil printers are extremely robust and easy to operate and maintain. smartTec is a total solutions provider of all you need in SMT solder paste printing and soldering.